Let’s get our enchilada on today, shall we? With just 3 days until Cinco de Mayo I hope I’ve been able to inspire you with a few new Mexican recipes this week to share with your family and friends. 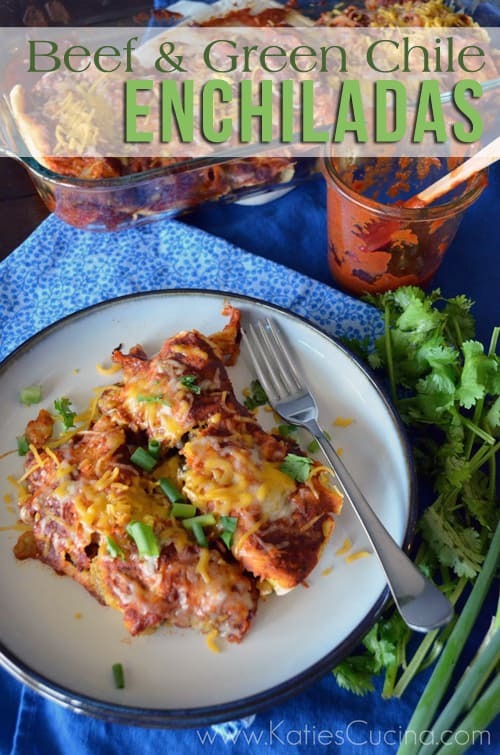 I’m the first to admit that enchiladas are not top on my list. I’d much rather prefer a chicken chimichangas or grilled chopped chicken tacos. But my husband on the other hand loves enchiladas. He has complained that my enchiladas were never that great over the years. That was until I created this recipe! I also created this recipe during my husbands brew day back in March. The guys tore threw my beef and green chile enchiladas faster than I could even try a bite! Our friend Ricardo (who blogs at The Beer Guerrilla) even mentioned to me that he thought these were extremely authentic and asked where I got the recipe… of course, me being me, responded “I just created it“! To be honest I was taken back by that statement. I have finally gotten to the level of cooking where I’ve turned everyday recipes into authentic recipes. Now, don’t get me wrong–that was just one person telling me that but I feel like I’ve finally jumped to the next level in my culinary journey. I think a big part of the authentic flavor came from my homemade spicy enchilada sauce. The deep bold flavors of this rich sauce really bring this recipe to the next level. So I can also credit me taking a risk and making my own sauce. Let me just tell you… you will want to lick the jar clean. If you can reserve a little extra sauce for topping/dipping your enchiladas in. We were all scraping the jar dry. We couldn’t resist the homemade enchilada sauce. So whether your hosting a fiesta this Sunday or just making a quiet meal at home with the ones you love… give these (authentic (I say that term loosely here)) Beef & Green Chile Enchiladas a try! Cook the ground beef in a skillet on medium-high heat for 5 minutes. Stir frequently, and break up the beef. Then add the chopped green chiles, garlic, and onions. Cook for an additional 5 minutes, stirring frequently. Add the drained black beans, mix well, and remove from the heat. Spray a large rectangular glass pan with cooking spray. Spread a half cup of enchilada sauce on the bottom of the pan. Warm the corn tortillas in the oven for one minute. Remove and then begin to create the enchiladas. One spoonful of filling per corn tortillas, carefully roll, making sure not to tear the tortillas. Place seam side down. Repeat until all the tortillas have been used/filled. Pour the remaining 1-1/2 cups of enchilada sauce over top of the enchiladas. Bake in the oven for 20 minutes. Remove from the oven. Top with 1 cup shredded cheese. Serve immediately and top with green onions and cilantro if desired. 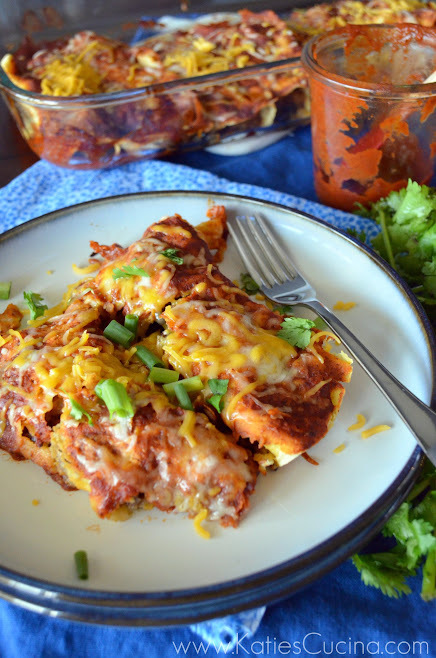 Hello saucy, cheesy enchilada goodness! I’m going to need to celebrate Cinco de Mayo for an entire week! Ahh these enchiladas look great! Thanks Alicia! I’m glad you enjoyed them. I love the idea of substituting for the green chile salsa. Cooking is all about what you have on hand!